Is Man’s Self-Centeredness the Reason Men Assume the Universe was Designed? As one of the bases for the assertion that it is rational to believe in the self-existent, transcendent and eternal God described in the Bible, Christian apologists point to the undisputed evidence of hundreds of just-right design features in the universe which make it possible for life to exist. In their view, all of the exquisitely fine-tuned design features scientists have found in the universe rationally point to the existence of an intelligent designer who intentionally designed the universe so it could support life (more>>). In response, some naturalists contend it is only man’s self-centeredness that persuades them to interpret all the just-right features in the universe as evidence that the universe was designed for them. Just like fleas on a dog might assume the dog was designed for them because they don’t appreciate the bigger picture, men look at the universe, see all the just-right features that make life possible and assume the universe must have been designed with them in mind. This article addresses the reasons Christian apologists maintain that analogies like the “Fleas on a Dog Analogy” don’t hold up under close scrutiny and, consequently, do not diminish the persuasiveness of intelligent design argument for the existence of God. Fleas on a dog (the “guests”) may or may not be self‑centered in concluding the dog (the “host”) was designed for them. But even if fleas are self-centered, that isn’t a rational basis for denying that the dog (which contains many complex design features) was designed for some purpose, or perhaps even several purposes (including providing an environment where fleas could survive). If the dog was designed for any purpose that design points to the existence of an intelligent designer. Similarly, men (the “guests” in the universe) may or may not be self-centered in concluding the universe (the “host”) was designed for them. But, if the universe (which contains so many undisputed and highly complex design features (more>>) was designed for any purpose (including providing an environment where men could survive), that design points to the existence of an intelligent designer. The strength of any argument made by using an analogy depends on the degree of similarity or dissimilarity between the subjects and objects being compared. Only if the subjects and objects being used in an analogy are sufficiently similar is it fair to refer to points of similarity to make a point or argument by way of inference. Those who propose the “Fleas on a Dog Analogy” suggest several ways in which fleas and men (the guests surviving on their respective hosts) are alike, e.g., 1) Both fleas and men are reliant on their respective hosts for survival (fleas are dependent on life-supporting dogs and men are dependent on a life-supporting earth/universe) 2) Both fleas and men are unable to appreciate the bigger picture, and 3) fleas and men are both self-centered in concluding their respective hosts were designed to permit them to survive. The dissimilarity between the cognitive abilities of fleas as compared to the cognitive ability of human beings is very significant. While men throughout the world (e.g., astronomers, astrophysicists, astronauts, mathematicians, etc.) exhibit a tremendous desire to explore and investigate the universe to determine why the universe is the way it is and why things in the universe work the way they do, fleas exhibit no comparable ability to explore and investigate the dogs they live on. There simply is no comparison between the ability of mankind and the ability of fleas to investigate their respective environments and come to well-reasoned conclusions about their respective hosts. The weakness of the “Fleas on a Dog Analogy” is further demonstrated by considering a significant difference between the two hosts being compared (dogs and the universe). Namely, although there are a number of hosts capable of supporting the lives of fleas (e.g., a whole pack of dogs and/or other animals such as opossums or raccoons), there is no direct evidence that even one other universe exists (more>>), much less a universe with all the just-right characteristics necessary to support life (more>>). Our universe is capable of supporting life only because it has all of the hundreds of just-right features which make life possible in this universe. These just-right design features have been found in the forces of physics (more>>), the expansion rate of the universe (more>>), the Milky Way Galaxy (more>>), the solar system (more>>), Planet Earth (more>>) and in life itself (more>>). As reported by astrophysicist and Christian apologist, Hugh Ross, astrophysicists have been unable to even hypothetically construct one other potential universe that is significantly different from the one we live in that would be capable of supporting any kind of conceivable physical, intelligent life. Collins proposes the most rational conclusion is that the biosphere (with all of its dials set at the just-right settings) was designed by an intelligent being so the biosphere would operate in a just-right way to support the life systems living in the biosphere. As set forth above, analogies like the “Fleas on a Dog Analogy” break down because such analogies don’t prove the objects and subjects used in the analogy weren’t designed for some purpose. If the objects/subjects were designed for any purpose, that design points to the existence of an intelligent designer. Such analogies also ignore important distinctions between the “guests” and “hosts” being analogized which make it unfair to draw the inference that the only reason men believe the universe was designed to support life is because of their self-centeredness. As confidently maintained by Christian apologists, there is simply no compelling reason why belief in an intelligent, purposeful designer like the God described in the Bible is not a rational, if not the most rational explanation, for all the exquisitely fine-tuned design features scientists have discovered in every aspect of the universe which are all necessary for life to exist. In the view of many Christian apologists, only a pre-existing bias against the existence of an intelligent designer would cause someone to conclude all the exquisitely designed, life-permitting features in the universe are only interpreted as evidence of design because of man’s self-centeredness. Slideshow Photo: This photograph of the Bubble Nebula (NG 7635) was taken by a camera mounted on NASA’s Hubble Space Telescope. NASA’s Research Team accredited for this photograph include Donald Walter (South Carolina State University), Paul Scowen, Jeff Hester, Brian Moore (Arizona State University), Reggie Dufour, Patrick Hartigan and Brent Buckalew (Rice University). Downloaded from www.wikimedia.org which states the image is in the public domain because it was solely created by NASA. 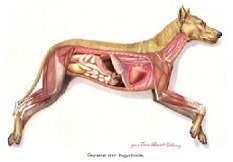 Anatomy of a Dog: This image depicts the complex internal organs and leg muscles of a dog. The image was downloaded from www.wikipedia.org which identifies the source of the image as Dr. Alfred Brehm and states the image is in the public domain in the United States because the copyright has expired. 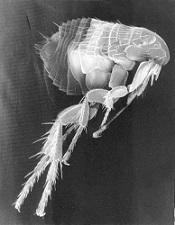 Micrograph Image of a Flea: This is a scanning electron micrograph image of a flea produced by the Centers for Disease Control and Prevention (CDC) / Janice Carr. The image was downloaded from www.wikipedia.org which states the image is the public domain in the United States because it is a work prepared by an officer or employee of the United States Government as part of that person’s official duties. 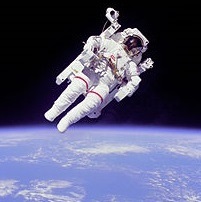 Astronaut Bruce McCandless II: This 1984 photograph shows Astronaut Bruce McCandless II using a nitrogen-propelled, hand-controlled manned maneuvering unit outside of the Challenger space shuttle. The image was downloaded from www.wikipedia.org (“Manned Maneuvering Unit”) which states the image is in the public domain because it was solely created by NASA.